Our very own Dr. Doan is running for charity in this year’s Marine Corps Marathon on 10/28! 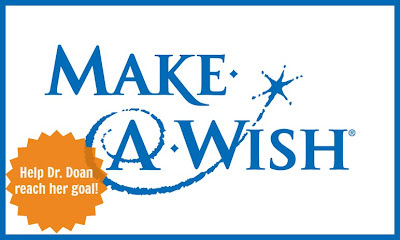 Help her reach her goal by making a pledge and show your support for the wonderful work that the Make-A-Wish foundation does. Read a message from Dr. Doan below! Thank you for your support! The Mid-Atlantic Chapter of the Make-A-Wish Foundation has had the privilege of granting wishes of over 7,000 children with conditions such as cancer, pediatric AIDS, cystic fibrosis, and heart disease since 1983. The funds raised from this event will continue to be used to serve children who reside in Delaware, the District of Columbia, Maryland and Northern Virginia. I thank God each and everyday for the greatest gift he has given me, Life. And as precious as it is, I pledge to make sure every minute of these children’s lives is worth every second. Please help me raise my personal goal as we are absolutely not limited there! Thank you for all your support. We had a blast at our anniversary sale on Saturday! Clients brought in their old frames to donate to the Lions Club and received $50 vouchers to use towards future purchases, they tried on eco frames and even received free lenses. We had a great turnout! As we approach the end of 2012, remember to schedule an appointment for an exam and use your flex spending. We want to thank our customers for four great years in business and we look forward to many more wonderful years serving the Del Ray and Alexandria community. Do You Stare at a Computer All Day? Sitting at a desk all day in front of a computer can cause a variety of health issues, from headaches to wrist pain, but have you ever considered the negative effects that staring at a computer screen can have on your vision? Help save your vision by following this advice from the American Optometric Association. Computer Vision Syndrome is defined by the AOA as “the complex of eye and vision problems related to near work that are experienced during or related to computer use.” There are several steps you can take to ensure that you are taking care of your eyes and maintaining productivity. Evaluate the following aspects of your computer/work station below and utilize the tips for optimal vision health. Screen Resolution: Better resolution leads to better clarity and will help you read your screen more easily, set your resolution to the highest possible for your monitor. Screen Contrast: Contrast should be adjusted so that the letters are easily read, you should also make sure that the screen is bright enough for you read without strain but not so bright that it hurts the eyes. Working Distance & Angles: Although this may seem obvious, many people do not have their work stations properly set up. 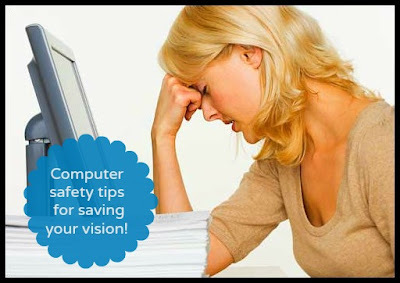 You should not have to strain or angle your head to read your computer screen, if you do have to angle your head, your prescription might need adjustment. – Have regular comprehensive eye exams and be sure to tell your doctor (Dr. Dora!) about the work that you do on the computer. Make sure you have the correct eyeglasses or contact lenses. – Ensure you have lenses that are specifically for computer use. – Remember to give your eyes a rest throughout your work day. – Using a humidifier can help reduce dryness of the eye. – Blink forcefully and install artificial tears. Following these steps provided by the AOA can help you ensure many years of good vision to come. If you are having trouble with your vision while at work or on the computer give Dr. Dora a call and schedule an appointment for a comprehensive vision exam.